A complete collection of responsorial psalms and Gospel Acclamations for the entire liturgical year. 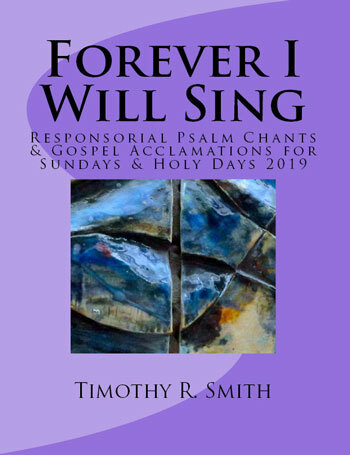 With settings for every Sunday and holy day of obligation of the liturgical year, Timothy R. Smith's Forever I Will Sing 2019 songbook features responsorial psalms and Gospel Acclamations suitable for any combination of piano, organ, SATB and guitar (with capo chords). The melodies, rhythms and harmonies of the refrains embody the spirit of the text, while the verses are set for solo voice with sustained keyboard or guitar accompaniment. The songbook offers psalm and Gospel Acclamation settings that use verbatim texts from the Lectionary. Featuring straightforward and easy-to-sing melodies, Forever I Will Sing 2019 can serve equally well as a primary annual psalm resource or as a supplement to an existing repertoire. For those musicians that find it helpful to hear music before playing and singing, Timothy has created online instructional videos for each psalm that are available on his website, timothyrsmith.com. There, you can also request free PDFs of assembly refrains with proof of purchase. The songbook includes liturgical, scriptural and alphabetical indexes as well as helpful "how-to" notes in the front of the book. Don't forget to check out the PDF Edition! Compare Forever I Will Sing with other psalm resources here.